For Israelis the spectacle of regional violence is self-affirming. It confirms Ehud Barak’s racist notion that Israel is a villa in a jungle and that tranquility inside this villa can only be afforded by high walls. It defines neighbors on the basis of their otherness and legitimizes indifference in preference to empathy. I’m not so sure; there are, sadly, also American constituencies who surely see things the same way. There are also close parallels between the voyeurs on the Golan Heights (or in this case Lows) and the ‘hill of shame’ from which the international media looked on at the Israeli attack on Gaza in 2009. Here too the media were joined by Israeli tourists with cameras, binoculars and picnics: ‘bombing as spectator sport’, as two angry commentators described it. There’s another personal, passionate report here. For more on watching Gaza, see Peter Lagerquist, ‘Heard on the Hill of Shame’, at MERIP and – absolutely vital, this – David Campbell‘s take, ‘Constructed visibility: photographing the catastrophe of Gaza (2009)’, which can be downloaded through his blog here. And Craig Jones has an excellent article culled from his MA thesis on ‘Shooting Gaza: Israel’s visual war’ in Human Geography 4 (1) (2011): abstract here. This can all be embedded in an emerging literature on ‘battlefield tourism’ or ‘war tourism’ – Richard Butler and Wantanee Suntikul have an edited collection, Tourism and war, out from Routledge this summer – but I think it’s more usefully connected to Rebecca Stein‘s pathbreaking work on the politics of tourism, especially her book Itineraries in Conflict: Israelis, Palestinians and the political lives of tourism (Duke University Press, 2008). You can find a more recent report from her, ‘An All-Consuming Occupation’, on the fourth Jerusalem Festival of Light in June 2012 and the wretched history of tourism that was concealed in its glare, at MERIP. She’s also provided an incisive examination of Israeli media coverage of the Gaza war – most eyes have been directed at international coverage – in ‘Impossible witness: Israeli visuality, Palestinian testimony and the Gaza war’, Journal of cultural research 16 (2-3) (2012) 135-53. 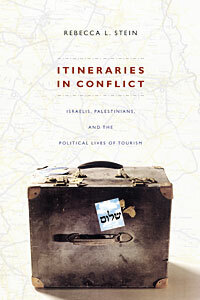 This article explores the emergence of ‘alternative Jewish travel’ to the West Bank and within Israel. One programme, aimed at diaspora Jews, reframes religious, cultural, and ethnic Jewish identity to include non-violence and solidarity with Palestinians as part of what it means to be Jewish. Another programme, aimed at Israeli citizens (both Jews and non-Jews), reframes Israeli national identity to include post-Zionist solidarity with Palestinians, but is not necessarily Jewish in any religious or ethnic sense. Alternative Jewish travel programme tours explore complicated questions of justice and nationalism in different ways that reflect their simultaneously local and global positions, who organises them, and how they define Jewishness differently. In Frames of War: when is life grievable? (2009) Judith Butler offered a series of reflections on other, no less violent visualities than those I have discussed here, but Aviv’s essay is worth reading alongside Butler’s response to the Jewish critics of her richly deserved award of the Adorno Prize by the city of Frankfurt: grace under fire. This entry was posted in imagery, Israel/Palestine, media, Syria and tagged David Campbell, Gaza, Judith Butler, Rebecca Stein by Derek Gregory. Bookmark the permalink.